With the advancement of science and technology, various beauty and skin care companies have sprouted here and there. There are just too many of them now. While some companies have the same products to offer, others have a quite unique offering. You may have read some of our skin care reviews in the previous weeks (i.e. Isomers, Arbonne, Exposed). But this time, it is all about Rodan and Fields Skin Care Reviews. In this article, we will explain what Rodan and Fields Skin Care is all about. We will also share how the brand evolved to what it is today. Also, we will discuss their products and the kinds of ingredients they use. In addition, we will also show you real customer reviews from different platforms. We hope you enjoy reading this article. And may this Rodan and Fields Skin Care Reviews help you find the right products for your precious skin. So, read on and stop worrying about your skin condition. Rodan and Fields Skin Care might be the answer to your skin problems. Ever heard of this company? Rodan and Fields Skin Care is redefining the future of anti-aging skincare. The company was founded by Dr. Katie Rodan and Dr. Kathy Fields. They are world-renowned dermatologists. Rodan and Fields Skin Care is a premium skincare brand. They are built on a legacy of innovative dermatology-inspired skincare products backed by clinical results. The company was established on the principle that living better in your skin means living better in your life. Rodan and Fields Skin Care believes everyone has the opportunity to make a difference in their own lives—and in the lives of others. Accordingly, Rodan and Fields Skin Care has a unique business model. The brand offers an unparalleled personal enterprise opportunity for individuals to join a community of like-minded entrepreneurs. 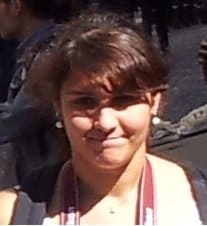 These individuals connect via social networks. At the core of everything they do is a commitment to creating positive change in people’s skin, in their lives and, ultimately, in the lives of others. Doctors Katie Rodan and Kathy Fields are both Stanford-trained dermatologists. They have developed a skincare line and founded the Rodan and Fields in 2002. Initially, Rodan and Fields skin care was a department store brand. They had previously developed Proactiv and licensed the products to Guthy Renker. In 2003, the Rodan and Fields company was purchased by Estee Lauder Companies. However, the business still operated somewhat independently. Rodan and Fields Skin Care launched on QVC and it has been highly popular since. Since then, they have been changing skin and changing lives as a social commerce brand. This company is now concentrating on multi-level direct selling through consultants. Rodan and Fields Skin Care enables independent consultants to pursue their dream of running their own business. The brand Rodan and Fields provides an excellent business opportunity for women who are passionate about skin care and selling products through friends and family. Their multiplier effect allows consultants to earn significant commission through a multi-level marketing approach. The Rodan and Fields skin care has many great reviews from their consumers. And only a few negative reviews on the web. Rodan and Fields skin care has been featured in Oprah Magazine, Allure, New Beauty and Vogue. Rodan and Fields Skin Care has four product categories. These include Redefine for aging and Reverse for age spots and uneven skin tone. There is also another category, Unblemish for acne and acne breakouts and, Sooth for sensitive, irritated skin conditions, such as Rosacea. Rodan and Fields Skin Care Redefine is best is your main target is the appearance of lines, pores, and loss of firmness. The Rodan and Fields Skin Care Redefine is based on Multi-Med Therapy. Redefine is a comprehensive skin care solution that combines cosmetic and active OTC ingredients. These contents help defend against and reduce the visible signs of aging. By combining the right ingredients, in the right formulations, and using them in the right order, the Regimen refines skin texture for softer and smoother-looking skin. It effectively minimizes the appearance of pores by removing pore-clogging dead skin cells. Rodan and Fields Skin Care Redefine reduces the appearance of lines and wrinkles. And it hydrates and improves skin elasticity. In addition, this regimen helps to visibly firm the skin. It contains antioxidants and provides effective photostable broad spectrum UVA/UVB sunscreen protection. And lastly, it replenishes skin’s natural moisturizing factors (NMFs) through vitamins A, C, and E and other vital skin nutrients. We are all aging all the time. However, what that looks like is all up to you. Regularly using Redefine Regimen helps defend against and reduce the visible signs of aging for noticeably firmer, smoother, flawless-looking skin. This Rodan and Fields Skin Care cleansing mask is creamy. It is kaolin clay-based mask that dries in two minutes, drawing impurities from pores without robbing skin of essential moisture. It has finely granulated exfoliators that gently smooth the skin without disrupting skin’s delicate moisture barrier. It has an exclusive combination of pore-clarifying ingredients which minimizes the appearance of enlarged pores in this fast-acting, alcohol-free liquid vehicle. This Rodan and Fields skin care toner has gentle poly-hydroxy acids exfoliate pore-clogging dead skin cells. Meanwhile, oligosaccharides contain help reduce the appearance of pores. This is a moisturizing treatment with broad spectrum SPF 30 protection. It contains a clinically tested concentration of powerful peptides to reduce the appearance of lines and wrinkles and visibly firm skin. Rodan and Fields skin care Triple Defense Treatment has an exclusive SHIELD sunscreen technology that combines stabilized avobenzone and free radical fighting colorless carotenoids for effective photostable broad spectrum UVA/UVB protection. This is to visibly decelerate the signs of photoaging that appear over time. Optical brighteners minimize the appearance of skin flaws while skin protectant ingredients, dimethicone, and hyaluronic acid provide moisturization. This cream is an ultra-hydrating cream that replenishes skin’s natural moisturizing factors (NMFs) while you sleep. This Rodan and Fields Skin Care cream is for visibly firmer, less-lined looking skin in the morning. It contains clinically shown concentrations of peptides and niacinamide. All of this help minimize the appearance of wrinkles and to help maintain firmer-looking skin. It has a moisture-recycling complex of hyaluronic acid and glycerin. They help prevent moisture loss while 12-hour, time-released antioxidants A, C and E help replenish vital skin nutrients. This is a good regimen. It is easy to use and makes skin super soft and has helped my skin a lot. The cleansing mask used by the directions, irritated my skin a bit…it made my skin dry. However, my consultant told me to use it as a wash instead, and that made all the difference. So, I just apply to my wet face, like any cleanser, and rinse away. Now my skin is back to normal. The fine lines and deep wrinkles were not as noticeable. This product gave me the results that I wanted. My skin looked better. If you have sensitive skin DON’T USE! This product caused a trip to the Dermatologist. It broke my face out, caused redness and swelling! I don’t find that it was that moisturizing! This stuff is fake news. I tried to save a few dollars by buying it online and the product was just bad. I think the product is old and dry… and I feel like the toner and the SPF cream may have been replaced by different products because it smells different. I’m just buying through my friend who sells it because it’s not worth the effort and the doubt that this isn’t real or working. Rodan and Fields Skin Care Reverse caters to a full range of skin discoloration concerns—from dullness to stubborn dark marks and age spots. You need to use all of the steps in the Reverse Regimen to get results. Each step of the Reverse Regimen builds upon the previous step. This is to address every aspect of visibly dull, uneven skin tone and areas of dark pigmentation. Used in combination, the formulations provide exfoliation, skin lightening (for the Accelerator Pack), skin brightening and broad-spectrum sun protection. Therefore, skipping any step could hinder achieving maximum results. 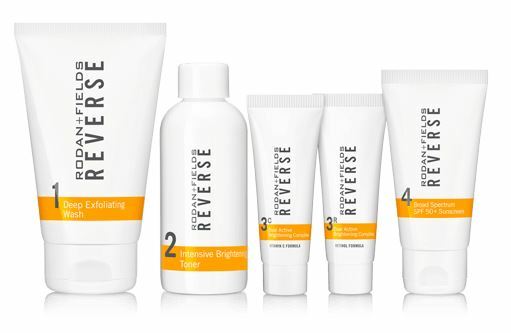 Clean your skin and see a brighter future for your skin with Reverse Brightening Regimen. We all know that exposure to the sun and the environment can leave you with less-than-youthful skin. So, to erase the appearance of premature aging including dullness, discoloration, and uneven skin tone, use this Rodan and Fields Skin Care Brightening Regimen. 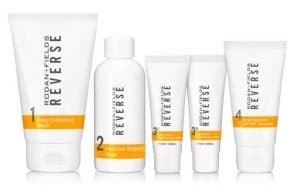 Reverse Brightening exfoliates, brightens, reduces the appearance of fine lines and wrinkles and defends against sun exposure for a long-term solution for a radiant complexion. First, you need to wet skin with lukewarm water. Using fingertips, gently and evenly massage a quarter-sized amount onto entire face for 30-60 seconds. Avoid contact with eyes. Rinse thoroughly and pat dry. Use once every other day and increase to twice daily as tolerated. Next, apply evenly this Rodan and Fields Skin Care toner to your entire face with a fresh Gauze Pads. Again, avoid the eye area. Do not rinse off. Allow the product to dry. You may use this in the morning and in the evening. Use once every other day for the first week and increase to twice daily as tolerated. After cleansing and toning, dispense an equal pea-sized amount of this Rodan and Fields Skin Care product from each tube, side by side. 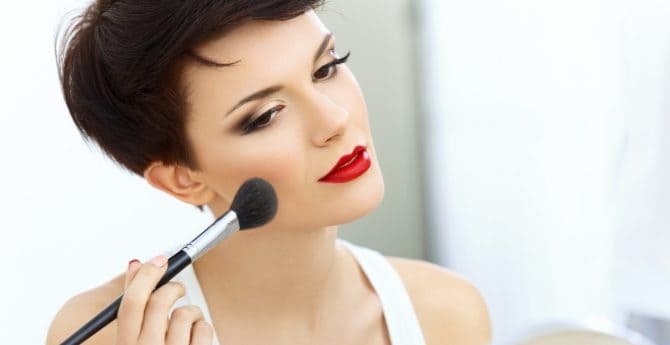 Blend the product and apply evenly over your entire face, avoiding eye area. Allow the treatment to penetrate your skin. Do not rinse off. Use once a day for the first week and increase to twice daily as tolerated. Apply a generous dime-sized amount evenly over entire face every morning. Reapply every 2-3 hours when exposed to sun and after towel drying, swimming or sweating. Avoid the eye area. After 2 weeks, my skin texture is smoother and my dark spots are starting to lighten. My sunspots are lighter and my skins is more even and smooth. Just be careful to not get it to close to your eyeballs, it burns. Probably a great product. But the small tubes of 3c and 3R do not last as long as the face wash and astringent and sunscreen. No matter how you stretch it, no way. I have had to order extra of those twice. Product all needs to last the same amount of time for convenience. Rodan and Fields has to know this. The WORST product I have ever used. I have used other R & F products and liked them. However this regimen not only ruined my skin after only two uses but also made my hands raw. the skin on my hands are peeling and cracked. My face has broken out in a rash. I had very clear skin prior to this and bought this product to clear up dark spots and for anti-aging. I’ve used this product twice and since my skin has broken out in multiple huge, puss-filled zits. Hopefully my skin will go back to normal quickly . This category of the Rodan and Fields Skin Care is for acne. 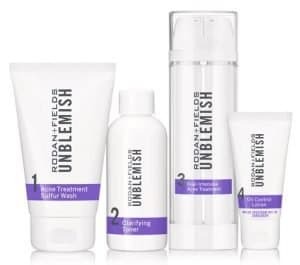 How does the Unblemish Regimen work? The Unblemish Regimen is based on Multi-Med Therapy. It is a complete solution that tackles the acne process—from clogged pores to excess oil. This Rodan and Fields Skin Care regimen prevents new blemishes from surfacing. Breakouts are continuously forming under the surface of the acne-prone skin. Therefore, the multiple active ingredients in the Unblemish Regimen should be used twice daily over the entire face to help stop the acne process. With continued use, blemishes will be reduced, and skin will look healthier and clearer. You can take control of your acne with the Unblemish Regimen. It is clinically tested to help stop blackheads and those pesky pimples before they become visible on your skin’s surface. They are found to combat the entire acne cycle. This Regimen helps unclog pores, calm your complexion and keep acne from making unwelcome appearances. This Rodan and Fields Skin Care Regimen combines cosmetic and active over-the-counter ingredients to penetrate pores and eliminate most acne blemishes. To use this Rodan and Fields Skin Care wash, wet your skin with lukewarm water. With your fingertips, gently and evenly massage a quarter-sized amount onto your entire face for 30-60 seconds. Avoid the areas around the eyes. Rinse thoroughly and pat dry. Use once daily and increase to twice daily as tolerated. Apply this Rodan and Fields Skin Care toner evenly to entire face using a fresh Gauze Pad. Again, avoid the eye area. Do not rinse off. Allow toner to dry. Use once daily and increase to twice daily as tolerated. Cleanse skin thoroughly before applying this Dual Intensive Acne Treatment. Dispense 1-2 pumps from each chamber, blend and apply evenly over the entire face while avoiding the eye area. Do not rinse off. Because excessive drying of the skin may occur, start with one application daily. Gradually increase to twice daily as needed or as directed by a doctor. If dryness or peeling occurs, reduce application to once a day or every other day and apply a moisturizer. If irritation or sensitivity develops, stop use completely and consult your doctor. Apply a generous dime-sized amount evenly over your entire face every morning, avoiding the eye area. I’ve been using ProActiv for about 15 years which had been great. I made the switch and my skin LOVES this product. Although, I had moderate adult acne even with the ProActiv but with this, I think I’ve had maybe 3 spots in two months since I started using it. It definitely agrees with my skin. I actually look forward to taking a shower so I can wash with it. Crazy, I know. Just a real mom here. I have always had acne, but lucky me I get cystic acne. I’d discovered this line around 2006 when it was sold at Nordstrom and was a fraction of the price. I think the entire kit was under $50. So, I felt like I discovered a miracle cure for my face, because I went from having bad skin to being completely clear in a matter of weeks. When they pulled the line from retail and decided to sell via consultant I was bummed but whatever I kept buying. Despite the product being practically the same, I stuck with it despite massive price jumps. Literally, one month I was paying $50, the next month $120, and so on. At the newest price of $170 (plus shipping) which started about 2 or so years go, I decided to try and find another product. I also never found a consultant so I was buying direct from the company, and they had an auto enrollment plan where they just sent you product. The company as a whole got into a bit if trouble for this as it was something they did to people without permission, wouldn’t cancel and wouldn’t take back product they just sent and billed for. Anyway although I loved the product, I got fed up with the company. I was very skeptical when I purchased this product. Before, I used to use Proactive a few years back, and I felt it only worked temporarily. When I finally gave in, and started using the R+F product, my skin would get extremely dry and flaky. Sometimes I would use a different moisturizer than the one in the regimen. After a month, my acne did start to fade away. I do have cystic acne, so I was pleased to know I was not getting much like I used to. It did clear my skin completely at one point, and no pimples on my face. The downside of this product is that it is way too expensive, and if you stop using it consistently, you will get your acne back. Everyone’s skin is different, and reacts to products differently. For someone that is skeptical, this product does work, with a few setbacks. (i.e. Cost, and consistency of product). This stuff did not work for me at all. It did not get rid of blemishes or prevent new ones. I decided to go with R&F at the recommendation of my doctor because I’m pregnant and this product line is sulfur based and safe to use, but I almost feel like it exacerbated my problem. I purchased the starter kit (at a very hefty price) which came with a facial wash, toner, acne treatment, and oil control moisturizer. The only product in this kit (hence the 2 star rating) that I feel worked is the oil control moisturizer. It kept my skin oil free for most of the day. Other than that, it was a complete waste of a pretty good chunk of change and I regret buying it. Rodan and Fields Skin Care Soothe caters to sensitive skin. How does the Soothe Regimen work? 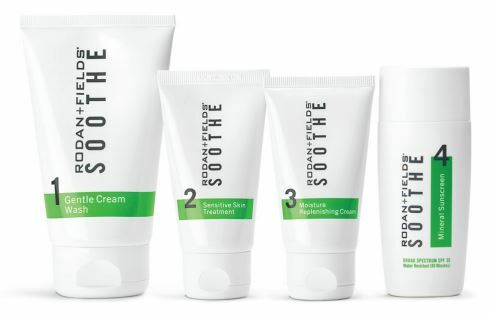 The Soothe Regimen has been carefully formulated with ingredients specifically designed for sensitive skin. Soothe Gentle Cream Wash of Rodan and Fields Skin Care emulsifies makeup and other skin impurities. 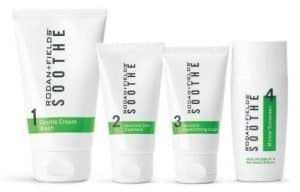 Soothe Sensitive Skin Treatment contains the OTC skin protectants, Allantoin and Dimethicone, that alleviate minor cuts, burns and peeling associated with dryness. The RFp3, their proprietary peptide technology, that neutralizes environmental triggers and calms irritated, dry skin. Optical filters help reduce the appearance of redness and the botanicals comfort the dry skin. Soothe Moisture Replenishing Cream utilizes unique patent-pending RF Cold Fission to keep ingredients together in an elegant base without the use of emulsifiers. Soothe Mineral Sunscreen SPF 30 uses only physical sunscreens (Zinc Oxide and Titanium Dioxide) to deflect ultraviolet rays and to keep the surface of the skin cool to help prevent visible redness. This Rodan and Fields Skin Care Gentle Cream Wash sweeps away impurities without the use of harsh surfactants. It contains essential moisturizing ceramides that nurture the skin’s barrier to support its resiliency. Hydrating lotion with exclusive RF p3 peptide technology helps to heal the visible signs of dry and sensitive skin. Dimethicone and allantoin fortify the skin’s barrier to relieve dryness and reduce the signs of sensitivity. Optical filters effectively neutralize the look of visible redness. Rich, dewy formula soothes, hydrates and nourishes skin. Utilizes RF Cold Fission technology to replenish skin’s natural moisturizing factors without the use of traditional emulsifiers. It is a water-resistant (80 minutes) Broad Spectrum SPF 30 contains only mineral-based sunscreen ingredients to protect skin without compromising skin’s delicate moisture barrier. This lightweight formula by Rodan and Fields Skin Care calms, soothes, and minimizes the appearance of visible redness. HIGHLY RECOMMENDED!!! I have Rosacea and pretty much allergic to everything which causes to make my face really red and break out. I used this stuff for only 2 weeks and applied just the wash and the sensitive skin treatment cream at night and it helped a lot. Now I use it in the morning and night to get better results. I have used everything and this is the only thing that works. Def worth the money! Also olive leaf extract liquid pills work pretty well. Bought this regimen through a consultant, I have sensitive skin that would often become red and inflamed, especially during the winter months. I used all products as directed and my face is much calmer, no more redness. I am now trying the reverse regimen now that I have soothed my skin! I would recommend this product to anyone suffering with rosacea. After one week, I had relief from red, dry, itchy, scaly skin on my face. Having tried a variety of other products over the past 5 years, I finally found one that actually works. I have used the Soothe Regimen now for 2 weeks and the symptoms are completely gone. Easy to apply and soothing to the skin. Seemed pricey at first, but considering all the other products I have purchased and tried without success, this one actually offers a good value. I was really hoping this would be the dream product that my sister had purchased and had cleared up her red and slightly rashy face. Unfortunately it was more of an irritant than the typically sensitive skin cleansers and lotion I used from Whole Foods or PCC. I also wish I would have purchased for the first time through a rep or the company directly since then I could have returned after first use and not have wasted so much money for a trial. As promised, here are other Rodan and Fields Skin Care reviews from different platforms. I hope these reviews can help you. This site strives to provide people with the best information on beauty, health, skincare, fitness and weight loss. This includes the top supplement reviews and cutting edge information on diet and exercise that will help them succeed. Rodan and Fields Skin Care range is developed my dermatologists with proven track record. They are fragrance-free and simple. The ingredients are generally the same as many other products so it will have some positive effect. And lastly, certain products such as Rodan and Fields skin care soothe reviews seem positive. The Rodan and Fields skin care categories are incredibly high prices. Rodan and Fields Skin Care as a multi-level marketing is a hard sell. Some untrained consultants are being marketed as experts. And finally, there is no clinical evidence the products work any better than lower-priced products. The Dermatology review is a comprehensive resource on skin care products, cosmetic ingredients and beauty how to’s. Below is the site’s Rodan and Fields skin care review. I’m a licensed esthetician. The creators of Rodan & Fields are the same creators of proactive. The ingredients in both of these lines are pretty harsh on the skin. Alcohol is found in the third listed ingredient on more than a few products. The consultants are not licensed to determine which products can best suite your skin type/condition. Even in proactive I’ve heard it doesn’t work for a lot of people and that’s okay. You’re gonna find that with every brand. It works for some- others, not so much. But when someone is having a reaction to any skincare, I suggest to stop using it right away. If someone has rosacia, I wouldn’t reccomend to do a chemical peel because it’s going to get inflamed and that’s not normal. So if burning, itching, inflammation, or anything along those lines happen with any brand of skin care, I reccomend to stop using it. Plus, with the other active ingredients such as retinol, glycerol, extracts and oils, there are products out there that are at a waaaaay lower price point. I have been using R and F for two years and could not be more pleased with my skin. I use the Reverse line and have seen excellent results. I had to call Customer Service once in the two years when my order did not arrive timely. The issue was resolved immediately and the company representative was pleasant. My step-daughter sells this line, and I am really shocked at their selling tactics. First off I told her that I try to avoid products that contain parabens, phthalates, and sulfates. So she went to her up line and they told her all products contain some degree of those things they don’t have to list them on the ingredient list. Seriously??? So, first off they lie to get sales? Then after months of pressure I finally bought the line for my husband and when it showed up one of the products had a warning on it that it had an ingredient in it that was known to cause cancer in the State of California. Plus these products do not all get 5 stars on the beautypedia. I have noticed my daughters skin does look a little better, but whenever you use retinoids they have the proven ability to work. I say do your research and get higher quality products that work. Our skin is a very important organ of our body. Not only does it make us look great, but our skin is also our first line of defense. It is necessary that we know what products we put on our skin. Before you try on any skin care regimen, make sure you have consulted your dermatologist first. Also, if you skipped seeing your skin doctor, at least do a patch test first before applying the products to your skin. The importance of doing this Rodan and Fields skin care reviews is for you to know what other people say about their products. Reading articles like this helps you save money and time. We hope you learned something from this guide and hope that it helps your search for the best skin care products.